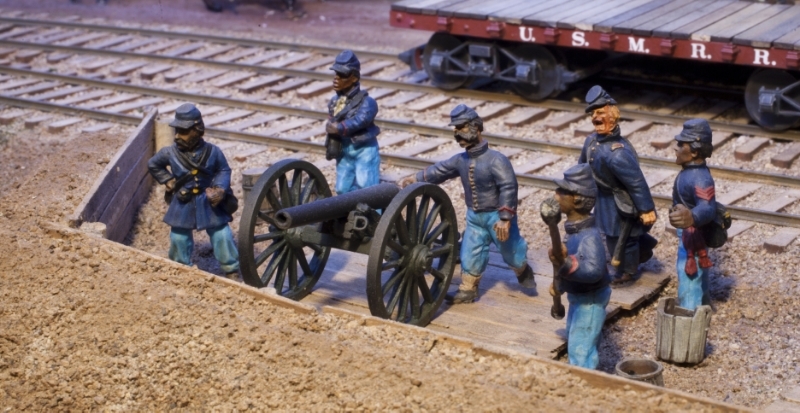 1/48th scale models of civil war era field artillery pieces. Each model gun includes a laser cut wood chassis, cast metal gun barrel and wheels and a set of photo etched metal detail parts. Three different guns are available, 12 pound Napoleon, 10 pound Parrot Rifle and a 3 inch Ordnance Rifle. To download the instruction sheet click here. USCT recruits drill on a 3-inch ordnance rifle. The gun is an Alkem Scale Models kit. The figures are from various sources and are not included in the artillery kit.